I know what you’re thinking. Is there anything more dietitian-y than having fruit for dessert? The answer is no. 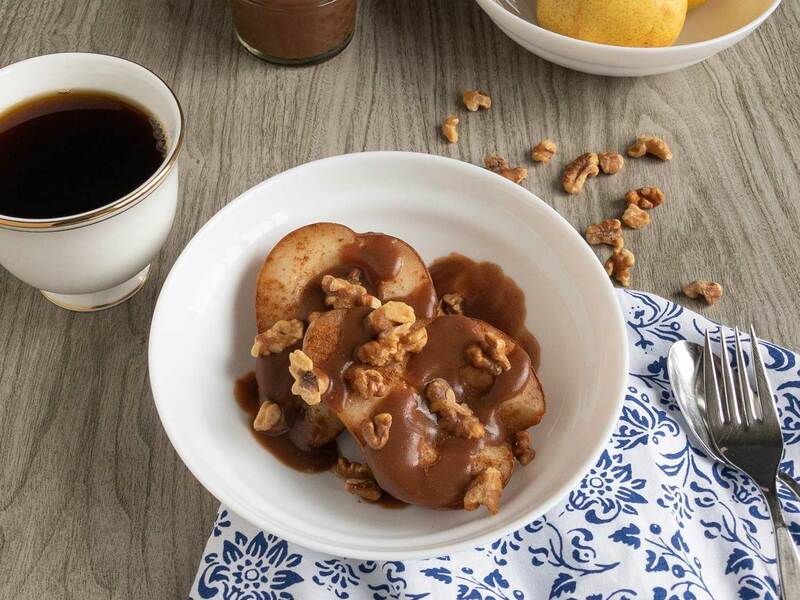 And these cinnamon baked pears with chocolate date sauce will show you why. Hint: Because they’re AMAZING!! This dish has everything you want in a dessert! Baking the pear makes it soft and almost melt-in-your-mouth, and the cinnamon really complements its sweetness. 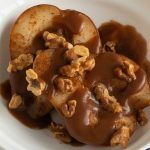 The walnuts give it some toasty crunchiness, and the chocolate sauce (arguably the star of the dessert!) adds a creamy, chocolaty, sweetness that pulls it all together. Another great quality of this recipe is that it’s fast, and requires only a few ingredients! You can make the chocolate sauce ahead of time – it will keep in the refrigerator for about 5-7 days, but I haven’t been able to keep it away from my kids long enough to reach that. Perhaps best of all, this is going to pull double-duty for you. To your taste buds, it’s just a fantastically sweet end to the meal. But to your heart, it’s a healthy pick-me-up! Check out my chocolate date sauce post and recipe to learn more about why it’s so amazing! We always seem to forget about pears. The spotlight is often reserved for much sexier fruit like strawberries, melons, and heck even bananas! Behold! The pear! Pears are a good source of vitamin C, and they’ve got some potassium and other vitamins, but where they really shine is in their soluble fiber content! Soluble fiber is a type of fiber that loves cholesterol so much, that it binds itself to it and takes it right out of the body with it. Pears have one of the highest soluble fiber content among fruit, and they’re available year-round, so they can be really useful in managing cholesterol. You probably know walnuts for their heart-healthy omega-3 fats. In fact, it’s one of the most well-researched nut related to heart disease, and is consistently shown to benefit people with heart disease. I recommend eating a handful of them every day. What better way get your daily dose than with these pears?! Still not convinced about fruit for dessert? Well, the only thing left to do then is to try it! My kids BEG me to make these pears for dessert! I know you’ll love them too! My kids beg me to make this for dessert. It’s sweet, healthy, quick, and oh so yummy! Place pear halves, flesh side up, on a parchment lined baking sheet. Sprinkle with cinnamon. Place walnuts on baking sheet, in between pears. Bake pears and walnuts for 15 minutes. Place 2 pear halves and 1/4 of the walnuts in each bowl, and drizzle with chocolate sauce. 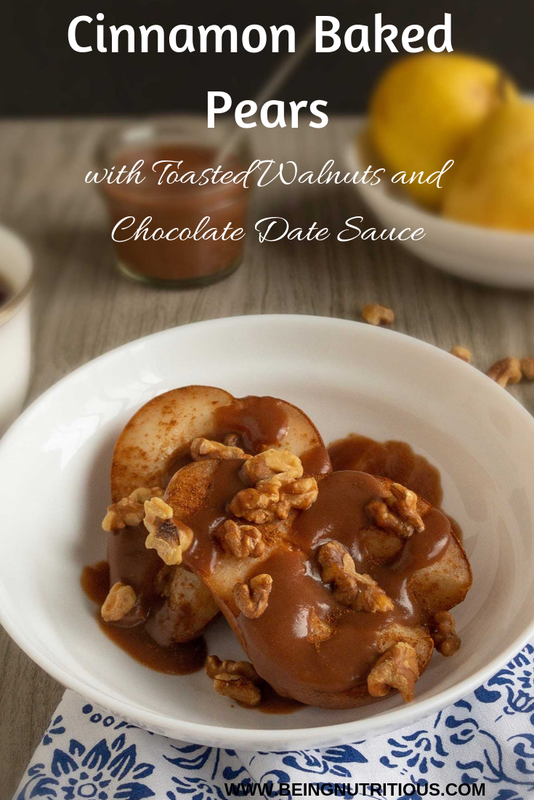 Get the Chocolate Date Sauce recipe!